At the height of Calico's silver rush in the 1880's there were over 500 mines. Most of them still exist. Primary Minerals: Silver and Borax. Gold was mined on a lesser scale in the 1930's. 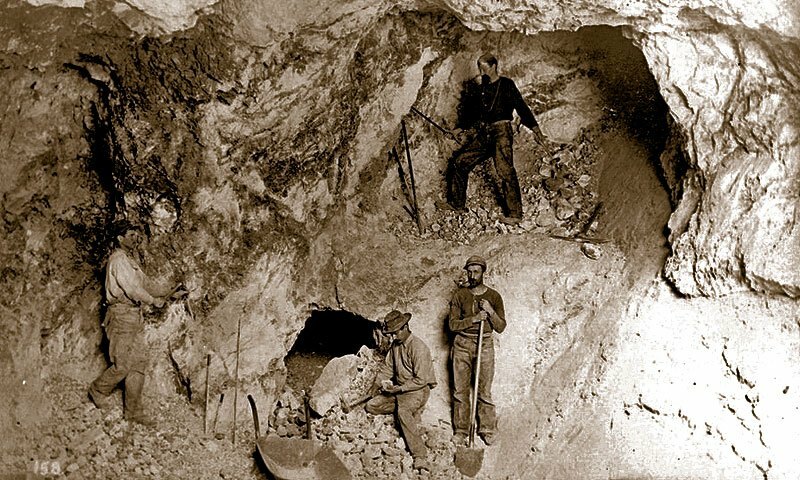 Years of Operation: Calico was the site of California’s biggest silver strike. The boom period began in 1881 and lasted through the mid 1890’s when silver lost its value. Borate mining kept the town alive, though most of the miners had left, even through the panic of 1906. In 1917 cyanide was used to recover silver from the Silver King mine dumps. During the early 1930s a small operation called the Zenda Gold Mining Company mined here for silver. Gold was mined from the Total Wreck (Burcham) Mine from the 1930s until 1941. This locked mine is probably being used for storage. Most shafts in this area are sealed with wooden covers. The history of Calico and its mines is so extensive that I’ve decided to divide this topic into two pages, Calico Mines and Calico Ghost Town. There are over 500 existing mines here, well over 100 years after the boom period. Most can be found in canyons or on hillsides throughout the Calico Mountains. Calico was mainly a silver mining town, which thrived for about 12 years, but then began to decline after the prices of silver plummeted. Later, Borax was discovered about three miles from Calico, which kept the town alive, for awhile at least. Not much gold was mined in this area, however the Total Wreck / Burcham Mine did mine for gold here in the 1930’s. The Calico Mountains are a geologist's dream. 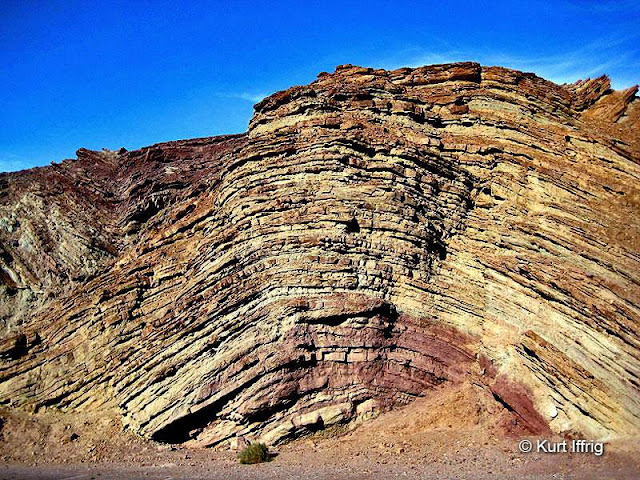 This beautiful rock formation is called a syncline. For several years there was a feud between two historic ghost towns (Calico and Bodie) to decide which one would be designated as California’s "official" ghost town. In the end, they both won. Bodie became the Official State Gold Rush Ghost Town, while Calico became the Official State Silver Rush Ghost Town. Calico was founded in 1881 after a group of prospectors discovered a huge silver deposit which would become the Silver King Mine. 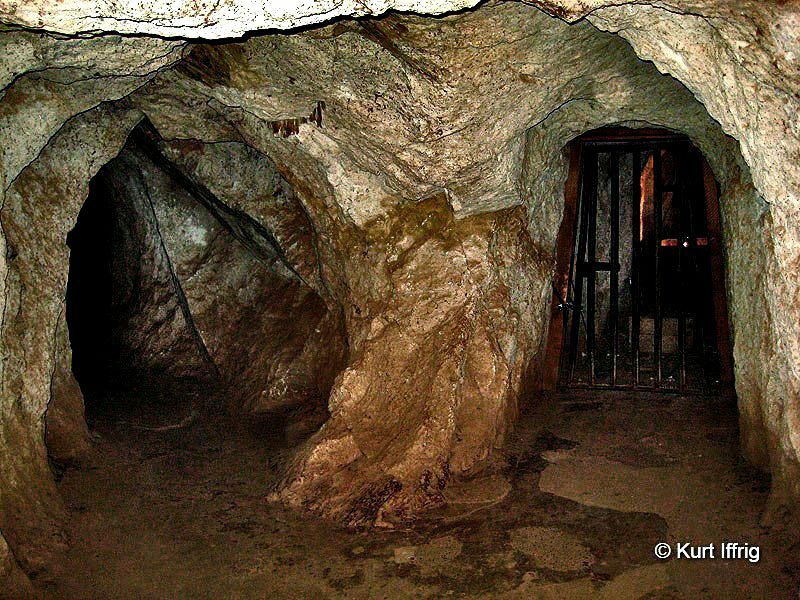 The mine was financed by John C. King, the uncle of Walter Knott (of Knott’s Berry Farm), who would one day restore the town to its former state. 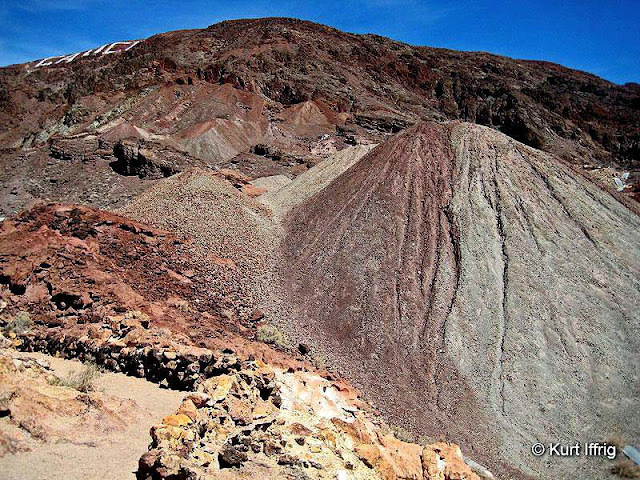 The town is named after the beautiful multi-colored hills that surround it. 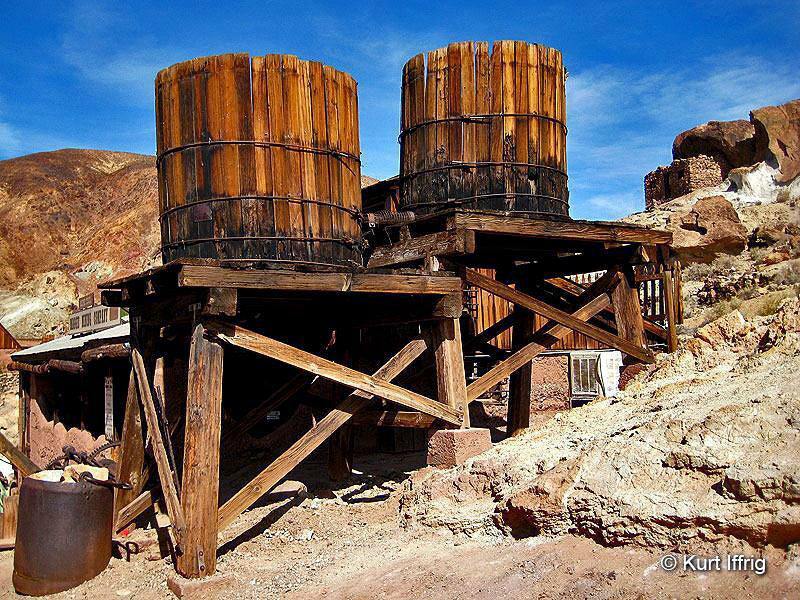 To read more about the history of the town click here... Calico Ghost Town. At dusk the Calico Mountains look like Mars. Hillside mines were used in the film Letters From Iwo Jima. It’s important to note that if you venture into the canyons and hills beyond the town, such as Mule Canyon, Odessa Canyon, Bismarck etc. 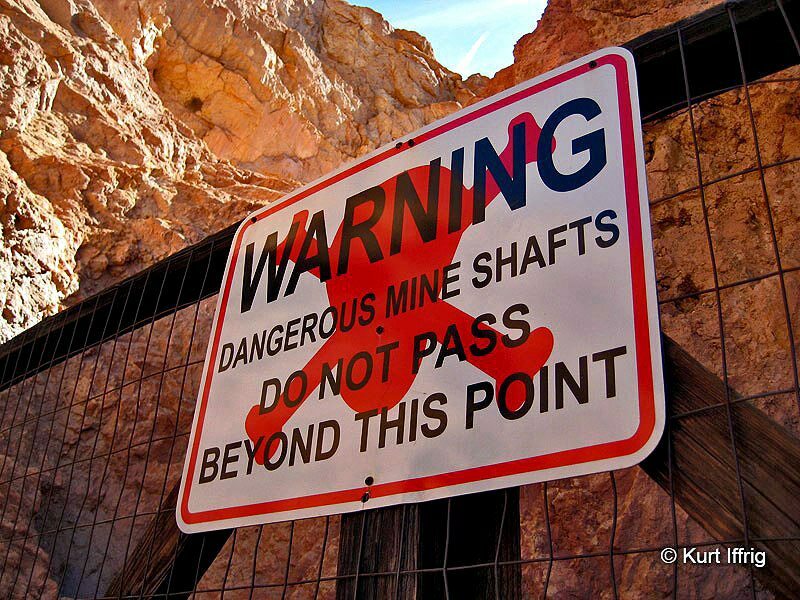 you will encounter lots of open mine shafts. 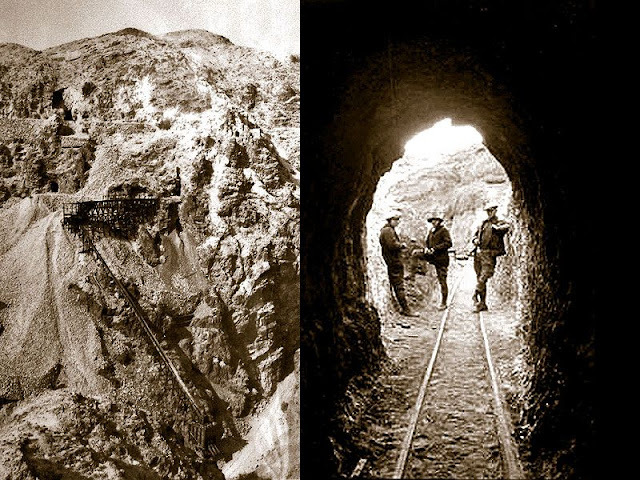 Within a 12 year period over 500 mines were dug throughout the Calico Mountains. And they're all still out there. There’s also a nasty snake in this area called the Mojave Green. It’s a medium sized rattlesnake that’s far more venomous than Western Diamondbacks or Southern Pacific Rattlers. And they’re not always easy to identify. They come in a range of colors and are sometimes confused with diamondbacks. This snake is widely regarded as having one of the most potent venoms of all North American pit vipers. You’ll also want to hike early, since the blistering temperatures in the Mojave Desert are sometimes comparable to Death Valley. These redwood barrels outside Maggie Mine are reproductions of old cyanide tanks used to process silver. Maurice Mulcahy Sr. was a silver miner in Pioche, Nevada, where he died in an accident in 1881. His widow Catherine brought their seven children with her to Calico around 1884. Eventually John, Jim and Maurice Jr. formed the Mulcahy Brothers enterprise and claimed, purchased or leased various mines in the Calico Mining District for many years. Around 1916, John Mulcahy purchased a mine he renamed “Maggie” which he and his brothers worked for several years. John died in 1931, but Maurice continued to work as a miner until his death in 1942. It is thought that the name “Maggie” came from a song that was popular during the silver strike. The Mulcahy brothers lived and worked in the tunnels for about 20 years. Many of the Mulcahy family members are buried at the nearby Daggett Pioneer Cemetery. For three bucks the staff will open the doors to Maggie Mine, but you can only enter the bottom level. Maggie Mine is only mine Calico deemed safe for visitors. Getting inside will cost you a mere three bucks (well worth it) and you won’t have to listen to a tour guide. They’ll just open up the doors and let you inside. The last time I was there I had the mine all to myself. There's only one level you’re allowed to explore because of cave-ins in the upper level. In fact, you can see the collapsed rear portal of the second level when you exit the mine. Some of the displays are pretty cheesy. The dummies they use to depict miners look like they were bought at a garage sale. Nevertheless, it’s an interesting and historic mine. Maggie Mine is forked and about 1000 feet long. Some of the dangerous areas are closed to the public. The structure surrounding the mine’s portal is not original. Inside there are some rare mining artifacts, including an antique dry washer, a few small rock crushers and a gigantic bellows hanging from the ceiling, probably from the blacksmith’s shop. On the wall there’s a map of all the old mine claims in the town. If you had entered this mine in the old days, there would have been ore cart rails along the floor. Reportedly the mine has not been widened. It’s about five feet wide and seven feet tall. The first thing you'll see in the tunnel is a display of minerals typical of those found in Calico. As the lights dim and the black light illuminates the rocks, a rainbow of color appears, indicating the presence of calcite, zinc, tungsten, etc. The ladder in this shaft leads up to a second level. That level is caved in and fenced off to the public. This mine is about 1000 feet long and forked. Some areas are fenced off, like an upward shaft to a second level and a cavernous stope area called Dead Man’s Drift. The displays are truly cheesy, and the sound effects are laughable, but if you can get past all that it’s a very interesting mine. In the 1890’s hydraulic drills were sometimes used to bore out mines, and there’s one on display. More often, hand tools were used, like picks, sledgehammers and dynamite. 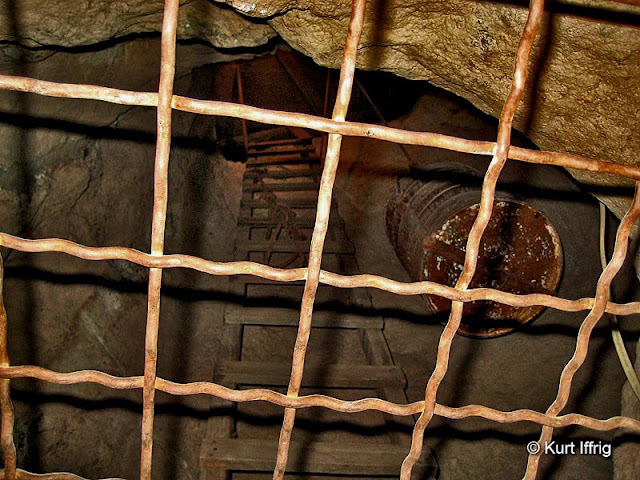 Two 100 foot chutes were used to drop ore down to the bottom level, and a bell system was used to warn miners down below when ore was coming down. Probably the most interesting part of the mine is a huge fenced off area called Dead Man’s Drift. This is an unsupported stope which was a concentration point for a multitude of ore veins. Chances for cave-ins were greater in these areas of mines, hence the harrowing name. This area is known as Dead Man's Drift. It's a dangerous & cavernous section of the mine with no supports. The gray-red mountains of low-grade ore in the photo below came from the Silver King Mine. Some years ago they were assayed at a value of 13 million dollars. So why is this precious metal just sitting there? It’s because the cost to process it would be more than 16 million dollars. Calico didn’t die for lack of silver. There are still mountains of it remaining, literally. But until the value of it goes way up, these piles will stay right where they are. When silver prices plummeted in the 1890s it was actually more profitable to mine for borate (borax), which kept the town alive for a few more years. You can imagine how deep the Silver King Mine is by the size of these tailings. I have not seen the inside as of yet, but I’ve heard there several levels. These piles of ore have been assayed at 13 million dollars, but processing them would exceed that amount. If you’ve ever visited Calico you’ve noticed those gigantic letters spelling out CALICO above the town. If you look carefully, about 300 feet below the “O” you’ll spot the portal to the Silver King Mine. It was Calico’s biggest producer, and the foundation of the boomtown. Unfortunately I can’t show you photos of the inside (yet), but there's a 3-4 hour tour available for those who want to see it. The tour company has a three person minimum, and it’s 50 bucks per person, which might seem excessive for some people, but to me it would be well worth the money. If you have any physical problems or are pregnant they won't let you in, and of course they’ll make you sign a waiver in case you get killed, but other than that it sounds like a great way to spend the day. 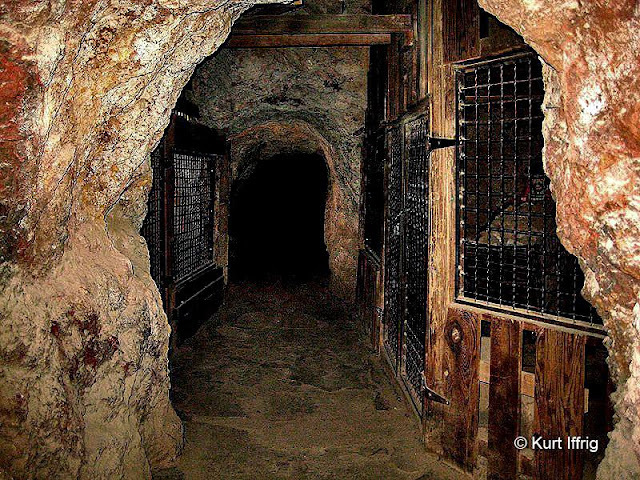 If you’re interested in taking the tour you can sign up here, Silver King Mine Tour. Left: This is what the Silver King Mine looked like in the late 1800's. Right: Explorers at the portal in 1926. On April 6, 1881, S.C. Wardan, Hues Thomas and John C. King located claims on Calico Mountain. They named their discovery the Silver King Mine. John King, the uncle of Walter Knott (of Knott’s Berry Farm) grubstaked “financed” the operation, which would become the top producing silver mine in all of Calico. By the spring of 1882 there were only 100 people living there, mostly in tents. The Silver King Mine was sold to San Francisco interests for $300,000. There were no less than 46 mines of note near Calico at that time, the most important being the Waterloo, Bismarck, Oriental, Garfield and Burning Moscow. 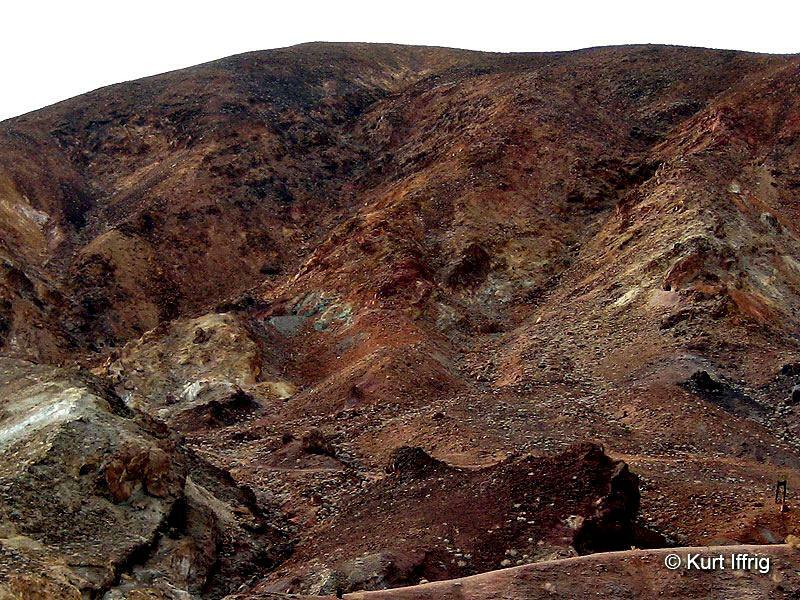 The Silver King Mine's silver ore was originally hauled to a stamp mill in Oro Grande, 40 miles away. The Silver King Mine initially hauled their ore to Oro Grande, some 40 miles away, but by 1882 a ten-stamp mill was erected beside the Mojave River at Daggett. There were numerous other mills built in the area. Hawley’s Mill at Camp Cody processed ore for the Cuba Mine and the Silver Odessa Mining Company. The ore from the Garfield Mines was stamped at the Barber’s Mill near Mule Canyon between 1883 and 1885. The Odessa, Oriental and Occidental Mines ores were processed at the mill owned by the Silver King Mining Company, between the mouth of Walls Street and Odessa Canyons. 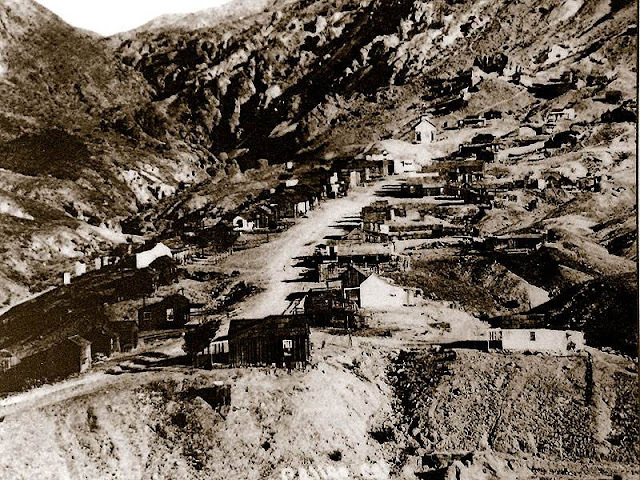 Calico as it appeared in the late 1800's. There was also a residential area away from the main town. In 1887 the Oro Grande Company began building a mill next to their mill at Daggett (which had been enlarged in 1884 to fifteen stamps). Unfortunately the mill burnt to the ground just before its completion, but it was quickly rebuilt. To cut down on transportation costs, a narrow gauge railroad was constructed in 1888 to bring in ore from the Waterloo and Silver King Mines. The price of silver soon plummeted, and both mines shut down by 1892, The Silver King Mining Company, based in London was shut down in 1896. The mines of Calico produced between $13,000,000 and $20,000,000 worth of silver. The Silver King was the biggest producer of all. A photo from the Red Cloud Mine, one of Calico's richest. The average daily wage for miners was $3.00. By the late 1890’s Calico’s population had greatly declined. 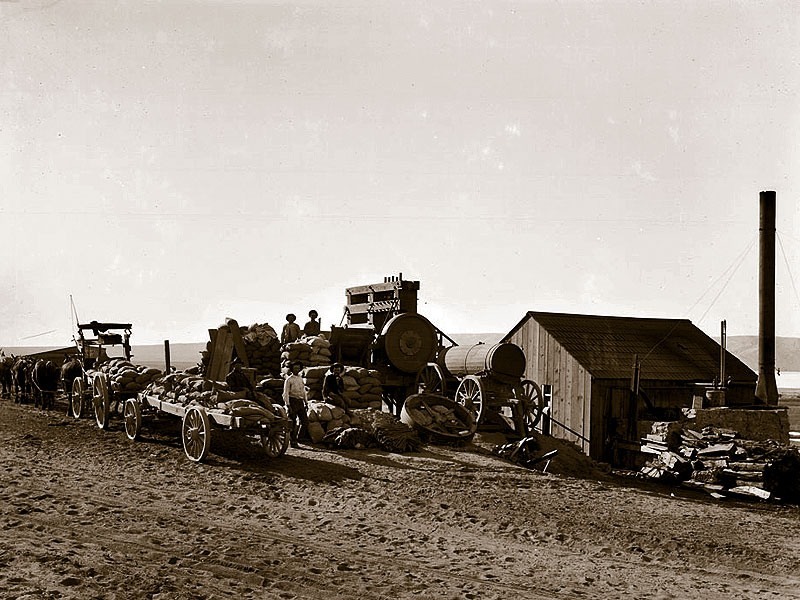 Borax mining became more profitable than silver, which kept the town alive for a while longer. 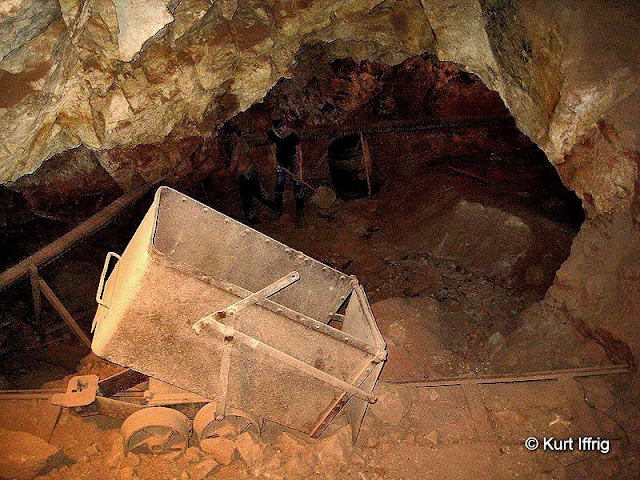 Around 1917 cyanide was used to recover silver from the Silver King mine dumps, and during the early 1930s there was a small operation, the Zenda Gold Mining Company, which mined silver. Gold was mined from the Total Wreck (Burcham) Mine from the 1930s until 1941. There is a strong possibility that the enormous quantities of low grade silver ore present at Calico will one day be mined. 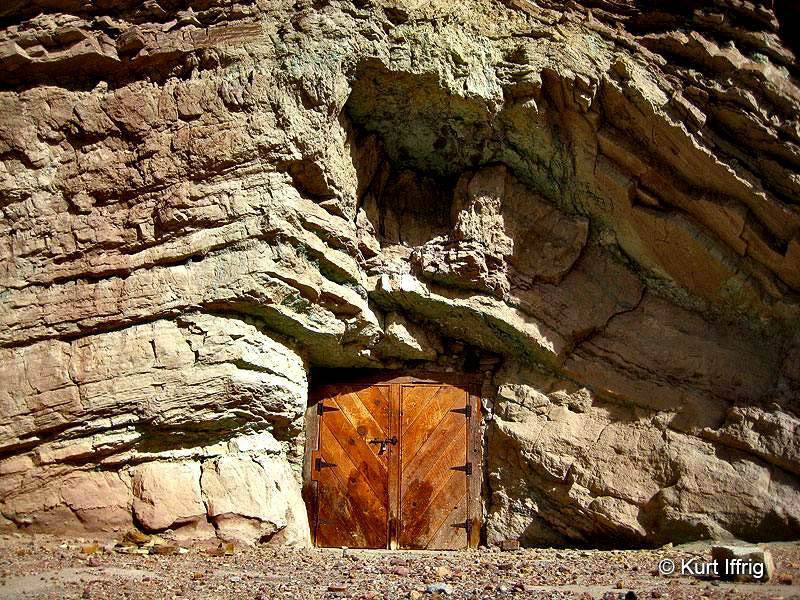 As a town, Calico, with its one street perched on an inclined mesa, had a turbulent existence. It burned to the ground in the fall of 1883, and was rebuilt. After it was vacated in the 1930s, the remains of Calico sat derelict until 1950, when Walter Knott, owner of Knotts Berry Farm in Buena Park, converted the ghost town into a tourist attraction. Three miles east of Calico, the town of Borate was formed near borax deposits in 1884 by “Borax” Smith. 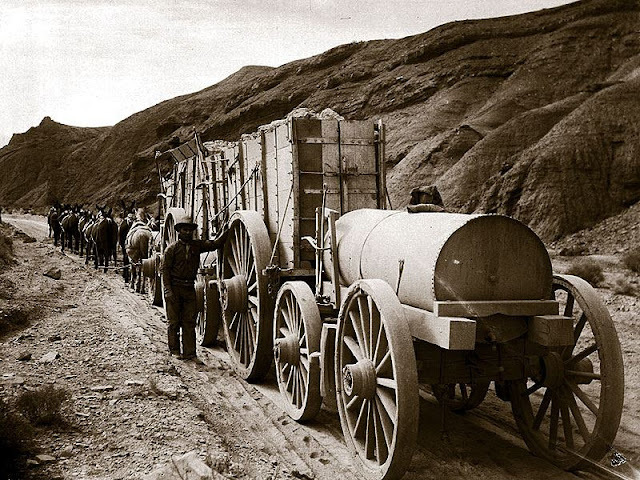 A railroad named the Borate & Daggett was laid into Mule Canyon in 1898. These borax mines were abandoned in 1907 after yielding nine million dollars worth of borax minerals. The wagons you see in the photo above were the largest ever pulled by draft animals. They were designed to carry 10 tons of borax at a time. Twenty-mule teams were made up of eighteen mules and two horses. Eventually this team would be replaced by the Borate and Daggett Railroad. When I was a kid in high school, my friends and I would go camping here and explore the mines. I remember many interesting and, sometimes, scary moments. The most exciting I remember--assuming my memory still works well--was discovering the whole inside of a hill that had been mined out. It seemed huge to us--it was amazing! The other experience I remember in this same spot was that there was a river (The Mojave?) flowing through--like a freight train. Is my memory good? Do you have a name for that mine? I'd never go back but would like a name. I haven't really explored the area around Calico, other than in the immediate vicinity. I know that there are over 500 mines that are still in those side canyons, and some go extremely deep. I've never heard of the one with the river running through it though. Sounds interesting.